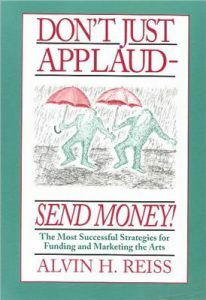 In Don’t Just Applaud, Send Money! noted arts management consultant Alvin H. Reiss details marketing and fund-raising strategies of enormous value to all arts organizations. Drawing on sources throughout the arts community (including orchestras, opera, dance and theatre companies, galleries, museums, arts councils, performing arts centers, and a zoo), Reiss has collected more than 100 new ideas proven successful in actual practice. Each case is clearly presented in a unique CPR format (Challenge, Plan, Result), and many are illustrated with a reproduction of the flyer, brochure, poster or letter used in the fund-raising or marketing campaign. The result is a handbook of concepts which can be adapted for immediate use…and which may inspire hundreds of other effective ideas.